Right below the new infotainment system are new air-conditioning controls. No climate control here, but the controls feel much improved and easier to use, and the new air-con system is completely electronic, which Mahindra says has gone a long way in reducing the dashboard’s wiring complexity. I would like to mention that the top-spec K8 variant we were driving featured a remote opening tailgate that can be triggered only using the button on the key fob, with no apparent mechanical failsafe – a strange choice if you ask me. The rest of the cockpit pretty much follows what we’ve seen before and there are no surprises here.Just like before, you can get the KUV100 in either a 5- or 6-seat configuration. We drove the 6-seat option that gets a bench for the front seat, although the driver’s seat is individually adjustable. Of course, you can seat three in the front only in a technical sense, and anyone but the tiniest of occupants will have trouble fitting their knees behind the dash-mounted gear stick. Thankfully, the middle seat can be flipped down to create a massive centre armrest for the driver and passenger and it even even gets a couple of cup holders. The NXT carries on the KUV’s tradition of offering interesting storage spaces, with a box that can be accessed by flipping the passenger seat up, and an under-floor space near the feet of the rear passengers.The glovebox too is surprisingly wide, able to accommodate a decent amount of stuff and gets a cooling function in the top-end model. Overall, seating space in the KUV100 is great, with ample amounts of knee, leg and headroom for all occupants. The seats themselves are quite comfortable, and ever under-thigh support all around is fairly decent. The driving position, though, is quite upright, like that of an SUV, so it gives you a commanding view of the road ahead. 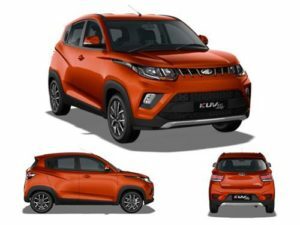 The KUV100 NXT has the same underpinnings as its predecessor, and we have had good things to say about the monocoque’s limited body roll despite its height, compared to small cars. The NXT features slightly retuned versions of the mFalcon 1.2-litre three-cylinder G80 petrol engine which produces 83PS/115Nm and D75 diesel engine which outputs 78PS/190NM from the earlier KUV100. At the small straights on the Mahindra test track, the NXT stayed stable at speeds up to 135kmph, and it will go beyond that but we will have to wait until we bring it in for a detailed road test to find out. With the micro-hybrid electronic start-stop system, the engine will turn off when placed in neutral for a short time, and restart when the clutch is engaged. Mahindra says that they’ve added new silent engine mounts to improve NVH levels in this KUV100 NXT. For the most part, I’d say they work well in the diesel variant we drove, isolating a fair amount of vibrations from the cabin. However, that doesn’t detract from the slightly annoying level of engine noise that still manages to creep into the cabin.With no mechanical changes to the monocoque structure or suspension either, ride and handling remains at what we’ve come to expect from this little crossover. The tall design means that there is a bit of body roll when you pitch it into corners, but it does manage to remain confident and under control if you get a bit aggressive with the steering. Suspension setup is still on the softer side, so it should still be able to handle real world roads quite well. On the whole, it pretty much feels like a tall hatchback to drive and that’s a real plus point for those who might feel intimidated with the notion of getting behind the wheel of an SUV.